Wednesday, July 26 – With at least ten counts for exceeding the tint limit, Julio Adams of Purcell Estate will have to pay $9,320 or face imprisonment. This was the total fine after his appearance in Magistrate’s Court late last week. Adams fines included penalties for driving an unlicenced vehicle and driving an uninsured vehicle. Traffic officer Constable Glen Callwood says the vehicle owner racked up these charges over a two-month period. “In November of last year, I stopped his vehicle and reported him for exceeding the tint limit stipulated by law. He was seen again in early December in the same vehicle with the same tint and reported and then again in late December of 2016. The fine for each window that is overly tinted is $750. He was also charged with driving an unlicenced and uninsured vehicle,” he said. The Royal Virgin Islands Police Force has warned vehicle owners that while the risk to driving a vehicle with tint exceeding that stipulated in the law may seem small, the penalties are high. Front windows should have a reading of no less than 35% light penetration while the front windshield should have no tint at all. Back windows should have a reading of no less than 20%. Store-bought tints combined with factory tints will likely exceed the tint requirements stipulated by law. Head of the Road Policing Unit Inspector Dariel Robinson encourages vehicle owners to contribute to a safer Territory by abiding by the law. 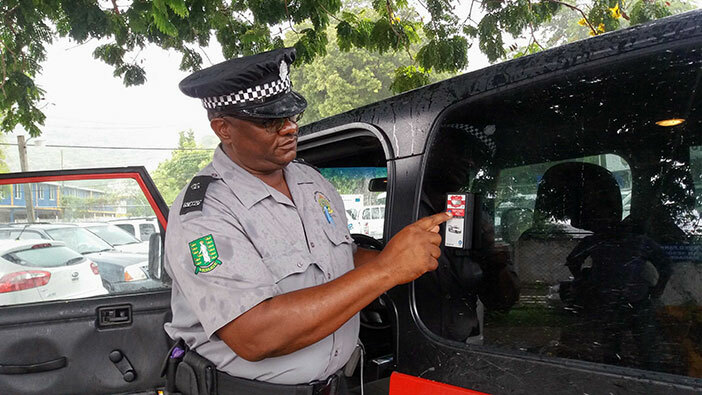 Any questions about the limits as it relates to vehicle tints, persons can either contact or visit the Department of Motor Vehicles or the RVIPF Road Policing Unit.